Viridian for Copper, Elemental Exchange. Rousing Shadows and Lovers, crimsons collide. Ethereal Queen Born from muttering crone. Mystic humming, via Motley winds due East. This is the fourth verse in a week long Autumn, Halloween, seasonal change, Mystical, light and dark collaboration with Morgan, from http://booknvolume.com/ . Morgan has written verses one and three, as we continue our week long collaboration. I am thrilled to be writing along side Morgan, as her inspirations capture me daily. One day I find her writing of a fantasy world I can’t even begin to dream of, but would love to visit, and then in the next breath she’s left me a longing mess. I adore her poetry and her heart. Our verses are off the cuff and inspired by each other, isn’t that lovely?! The image above chosen by Morgan, and I think it is perfect. Please continue to join us this week, as we thrive on working with one another to bring you Autumn Springs. 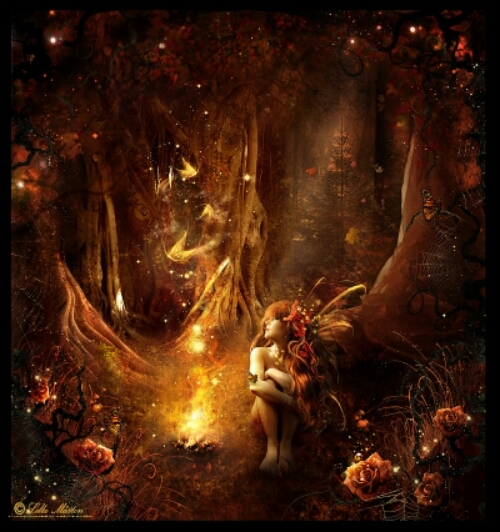 This entry was posted in Recent Posts and tagged Audrey Dawn, Autumn, Fantasy, Halloween, Hauntings, Hunter, Mystic, Nature, Passion, Poetry, Queen, Seasonal Change, Sprite, Woods, Writings, ~Morgan~. Bookmark the permalink. Wow, you two are really singing this. The changing of seasons is certainly giving you both great inspiration. I find that collaborations really do challenge us, don’t they? Especially when it’s somebody that you really admire. They can truly push us to grow. No! I can’t find it. *upset face* Where is that part? Well, it’s a more vicious type of thing, isn’t it? Umm, a Sprite is also a Leprechaun. Sprite rhymed… Oh well, *darn* Yes…ish, I guess. No way! Really? Is that what a sprite is? Shh…stop it. Don’t act like you didn’t know. Actually, I didn’t know at all. I have a hard time believing you, but I find it easy to trust you, so okay. Yes, Sprite is another name for leprechaun. I looked it up to make sure, but tis in the story of Puck, you see. Reblogging this collaboration with Morgan, as something was wrong with WordPress this morning. Morgan said she didn’t see verse four come through so I shall try a reblog…thanks for your patience, Morgan. I’m enjoying Autumn Springs. This is a mystical and magical collaboration! excellent both of you!! I adore your poetry!! You are one of my three favorite poet bloggers. What a beautiful collaboration!